Picture it: It’s fourth and goal from the 1-yard line—and the running back is following your lead. If you pancake the defensive tackle, you win the game. Are your arms, legs, and core strong enough to carry your team to victory? 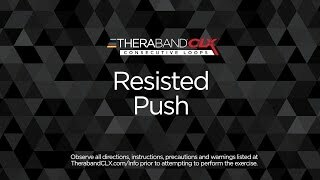 One way to make sure: practice the Resisted Push using the Thera-Band CLX. This motion mimics pushing an opponent—while adding resistance for the entire body. That way, you gain added strength while practicing the skill you need for your sport. Whether it’s a trophy and a ring or just bragging rights on the line, you want to perform your best when it counts. The Thera-Band CLX just might provide the extra edge you need for the win. Begin in a staggered stance and place your back foot into the middle Easy Grip Loop of the CLX. Then with both feet in line with each other, grasp the ends of the CLX loops in your hands. Step forward with your non-anchored foot as you raise your hands into a "blocking" position.